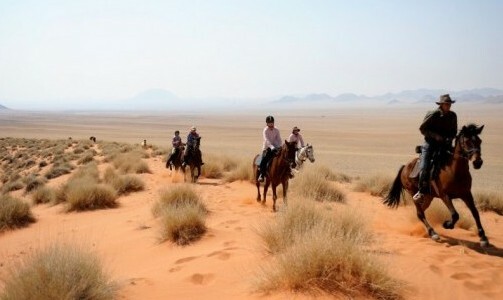 A horse riding holiday in South Africa at Horizon, nestled in the depths of the stunning Waterberg region, will without doubt be a special experience. Exploring the wonderful ranch where Horizon is based and the neighboring reserves, makes for some superb riding, with big open plains filled with game such as zebra, giraffe, hippo, jackal, hartebeest, impala, kudu and baboon. With no set itinerary, your riding holiday is fully flexible, and you can enjoy some of the other riding activities Horizon has to offer. 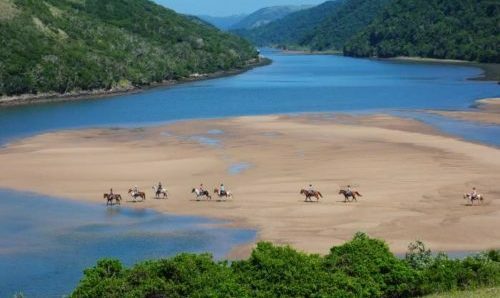 Ride through pristine wilderness and take your horses swimming in the dam, try your hand at Polocrosse – an extremely addictive game which combines both polo and lacrosse disciplines or take some of the talented horses round the small cross country course. As Horizon Lodge is part of a small cattle ranch there is also the chance to release your inner cowboy and try cattle herding. Each day is organised to suit you and you will ride in small groups, with those of similar experience, to allow for some exhilarating and faster paced riding should you wish. 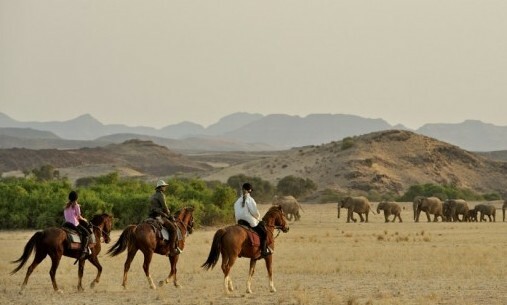 Riding alongside game, as you canter across iconic African landscapes, or quietly approaching a wallowing hippo or grazing giraffe, is a truly unrivaled experience and something you will never forget. The beauty of a riding holiday at Horizon is there is no dangerous game and thus they welcome riders of all abilities and it allows for those who seek it, carefree and fast paced exploration. Riding holidays at Horizon also offer the opportunity to trail ride to, and stay at their nearby Camp Davidson, situated high in the bushveld above the Matlapeng Valley. 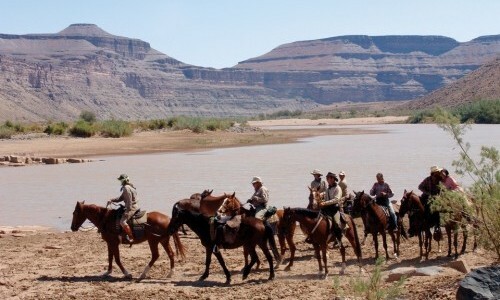 A stay at Camp Davidson can be combined with a stay at Horizon and offers the opportunity to trail ride and experience a journey in the style of Africa’s original pioneers. Get close to the bush and sleep under canvas in the tented camp nestled in the heart of the wooded mountains of the Waterberg. This excursion usually makes up either the first or last section of your stay at Horizon Lodge. Marakele National Park and Entabeni Reserve are also nearby. Marakele National Park is a wonderful place which today hosts one of the world’s largest breeding colonies of the endangered Cape Vulture. These magnificent birds can be seen nesting on the cliffs of the Santech towers, the highest point in the Waterberg, and providing unparalleled vistas. 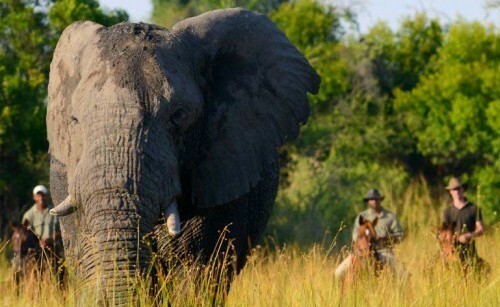 Entabeni Reserve is home to the big 5 and is a great place for game driving. There is no set itinerary and activities are extremely flexible. The group size of rides is kept small with no more than 8 guests and they can often accommodate those wishing to go out alone. There are a number activities available aside from outrides, such as a small cross country course (only available to those with previous cross country experience), the chance to swim with your horse, the chance to try your hand at herding cattle and lastly learning to play Polocrosse. 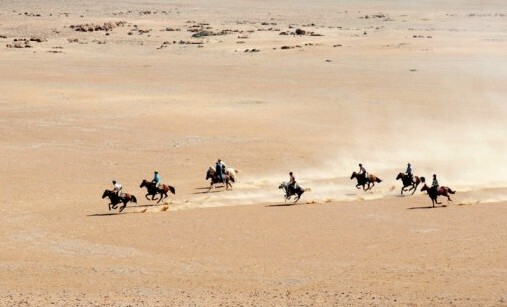 Each day there is the opportunity for 2 riding activities or outrides. In the morning rides will usually last between 3-4 hours (shorter rides can be requested). 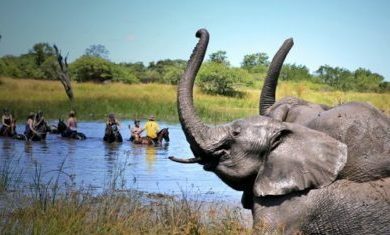 These rides will be different every day and with different styles; you might focus on game viewing one day, on another you might want to pick up the pace for some thrill seeking or go exploring through thicker bush. The afternoon rides will be shorter and often taken at a more leisurely pace. During the middle of the day, you may choose to spend your time relaxing, cooling off in the plunge pool or a going for a walk in the surrounding bushveld. 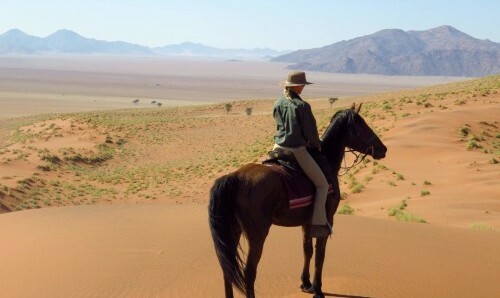 Throughout your stay you will get the chance to experience all the riding options and enjoy a great diversity of horseback experiences in South Africa. On the first and last days of your trip you will be transferred to Johannesburg International Airport (approx. 3 hours). Depending on the time of your flight there will usually be time to ride in either the morning or afternoon of your travel days. Day 1: Following a morning at Horizon Lodge, in the afternoon you will ride out for Camp Davidson, nestled high in the bushveld above the Matlapeng Valley. Explore the Matlapeng reserve before reaching a beautifully peaceful sundowner spot by Red Lake. Here you will likely spend your time watching the pod of resident hippo wallowing in the water, before you ascend the ridge up to Camp Davidson. 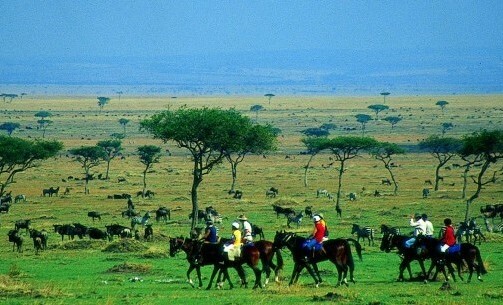 Day 2: Spend the day riding through Africa’s wilderness and experience the magic of tracking and finding herds of giraffe, zebra, eland, wildebeest, kudu and impala. The excellent terrain means you can follow intriguing game trails and weave in and out of the vegetation. Lunch will be taken out in the bush under a shady tree on the banks of a river, which crosses an old wagon route once used by the pioneers to congregate for church each Sunday. The peaceful and shady riverine forest will be used to escape the heat of the day, alongside the opportunity for a refreshing dip in the crystal clear waters of the flowing streams. 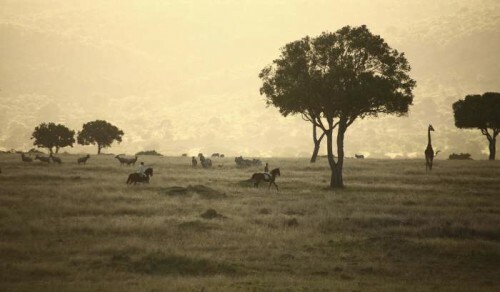 As the horses graze quietly, this idyllic setting will transport you back to a time when Africa was traversed only by horseback and many days were spent like this. Mount up again and meander back across the plains whilst the afternoon light bathes the landscape in the most spectacular light and colours. A day to remember. Day 3: Today you will ride out west of camp and make your to the historic Baber homestead, where a delicious lunch will be served by the pool. After lunch and some down time, you will have the chance to visit the local Sotho village and tour some of the traditional houses. Introductions are made with some of the local characters such as Martha Mosima, and the group of village lady elders, for afternoon tea which is accompanied by traditional singing and dancing. You will return to Camp Davidson that evening beautifully exhausted from a long and fulfilling day in the saddle, complimented by some African culture and history, to find a sumptuous meal served under the stars. Day 4: After rising to the dawn chorus and a delicious breakfast, explore a different section of the reserve as you return to Horizon Safari Lodge, in time for lunch in the garden. If you are leaving that day, spend the time before your sad departure relaxing by the pool, bird watching, visiting the local craft workshop which is a community upliftment project. The crafters specialise in beautiful handmade beadwork and leather products, including riding chaps. The charming Horizon farmstead boasts great views of the lake and surrounding bushveld. Set to this beautiful backdrop, the large colonial veranda is the perfect spot to relax with a drink in hand and watch the wildlife that visits the lake, absorbing your peaceful surroundings. There is a jetty on the lake which is ideal haven for the keen sunbathers out there. 2 Standard rooms, 5 Garden Chalets (Twin Peaks, Old Rondavel and Hippo Lodge) and 2 Luxury Chalets (Rock Lodge and Lakeside). These rooms can all be booked as a single, twin or double and each has its own en suite. On request it is possible to put a third bed into any room, but the standard rooms can only take a child on the third bed. The Luxury Chalets are set apart from the others and offer a more private experience. The Hippo Lodge rooms are of an equally high standard, but the rooms have shared verandas.